La Cinuelica is a new urbanisation composed of villas and apartment blocks restricted to 3 storeys. It is situated in the sunny Costa Blanca, in an area reputed to have one of the healthiest climates in the world. There are numerous Blue Flag beaches nearby, the closest of which is Punta Prima, just 1Km away. The urbanisation is easily accessible from 2 international airports, Alicante and Murcia. The neighbourhood is quiet and relaxing with a choice of activities nearby. The bustling town of Torrevieja is just 5Km away, and it hosts an outdoor market every Friday, said to be the biggest outdoor market in Spain. 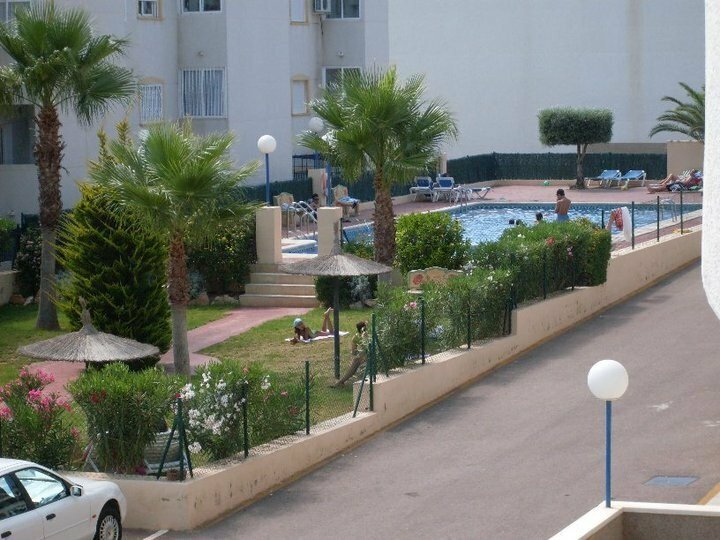 Just 15 minutes walk from the apartment are Villa Park III and La Florida, locally known as "Commercials", which host a variety of bars, restaurants and internet cafes. 5 to 10 minutes walk away are 2 supermarkets and a car rental. The apartment complex has a beautiful swimming pool, outdoor parking and the apartment itself offers a furnished, south facing balcony with a sea view. There are 2 bedrooms, 1 double and 1 twin, both with built-in wardrobes. The double bedroom has a built-in digital safe. Both rooms have bedside lockers, lamps and ceiling fans. There is a sofa-bed that can sleep an additional 2 people. Bedding and towels are provided. The kitchen is fully-equipped and includes kettle, crockery, fridge, cooker, oven, microwave, washing machine, iron and ironing board. The dining area has a table and chairs for 4. The sofa comfortably seats 3. Both living and dining areas have ceiling fans for your comfort. For your entertainment a TV, DVD, CD/Stereo system are provided together with a small selection of DVDs and CDs. Apartment may sleep up to 6 people, please see "Sleeping Arrangements". Apartment is on the First floor and is only accessible by stairs, there is no lift. A 40 Euro cleaning fee is payable at time of key pick-up. Optional airport transfers and welcome package are available. The maximum length of stay is 11 months. Detailed directions and information on obtaining property keys are provided on full payment.